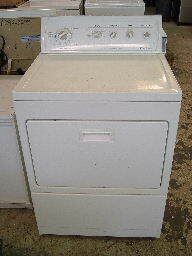 I bought this dryer along with a Washer in December of 2003. I was super excited about this dryer when I bought it, and I am still in love with it today. It is a super capacity dryer that will automatically shut off when the clothes are dry. It also came with a shoe drying rack, which is cool, but I have never honestly used. Probably the best part about this dryer is that it will hold anything in it that you can get out of the washer, with room to spare. I can fit large comforters or plenty of jean pants in this dryer and it will take the abuse. It has never burned my clothes or left me dissatisfied. However, I do have some complaints. The inside of the drum has changed color over the years and seems to like maintaining itself in a bluish kind of color with red tints. I do miss the bright white it used to be, but this is after 4.5 years of heavy abuse. I bought this dryer with a quiet pack, and for a very long time the dryer was wonderfully quiet and is still quieter than any older dryer I have ever had; however it has picked up a relatively annoying squeak that seems to be amplified by heavier loads. I would assume this is probably a belt of some sort working its way out. For the washer and dryer set I paid somewhere around $600, which I believe the dryer was the more expensive. In either case, I love this dryer because of its large capacity and its ability to stop running when the clothes are dry. the coils cost me 33 dollars easy to take out easy to put in. just need to have an angled phillips screw driver. How to remove blue tint inside dryer drum? I have found in the past that the bluish tint is merely the build-up of fabric softener and conditioner coming from the constant rubbing and tumbling of the clothes. To remove, I bought a can of tar/paint remover from an auto supply store. It's the brand that is designed to rub out all sorts of spots, grease, paint smears and other small defects on automobiles. Take a rag, pull it over your forefoinger stick this into the top of the can of remover. Invert the can for a second or two to moisten the cloth. Next, rub that wet area of the rag onto the blue tint area. If the blue disappears after two or three rubs in one spot, keep repeating the process until you remove all the blue residue. WARNING: you shouldn't do this more than a couple of times of year or else you will eventually wear down your paint layer of the dryer drum. Try using less fabric softener! I have never had a problem until the last week. I had a load of clothes in drying, came home, and the dryer had quit. Died. I have power on both ends from the 220 outlet to the dryer connection but nothing will come on not even the light. I am confused. I bought this pair with the quiet pack and loved it ever since. The Timer recently went out. I called a mom & pop repair service to come fix it. Turned it on with the new timer and the door switch went out right away. He ran a 'jump' to bypass the door switch so that the dryer could come on. Ended up frying my wiring harness and said the problem was that there are 5 grounded wires in the harness. Well YEAH, AFTER he fried the harness he expects me to believe that?? AND he said I need to buy a new wiring harness! Am going to get a certified Sears repairman to come fix the whole thing then take this guy to small claims court for the cost. I LOVE this dryer. Kenmore 90 dryer a good one. My model was the 6793270 - white. I have had the Kenmore 90 gas dryer for 11 years, it recently stopped working. The tech service guide indicated to replace the EvenHeat board (cost of $123), then who knows if that would fix it. But I have loved it for 11 years, very quiet, never had an overdrying problem or had any static in my clothes and never used any Bounce or fabric softeners. I did have a problem with my venting setup, which caused a lack of airflow. The dryer would then stop heating up, which is exactly what should happen, else your house burns down! Anyway, I might buy another one. One design drawback is the down-opening door, It's a little difficult to reach in to get the clothes out, and you must bend way down.